L 45-55 cm, WS 97-118 cm. Breeds on bogs in open taiga, marshes or shallow lakes with much vegetation, also on moors and heathland in flat country or hills. Open country in winter. Food small mammals, birds. Nests on ground. IDENTIFICATION: Recognized as a harrier by long wings and tail, and low flight with wings raised in shallow V when gliding. 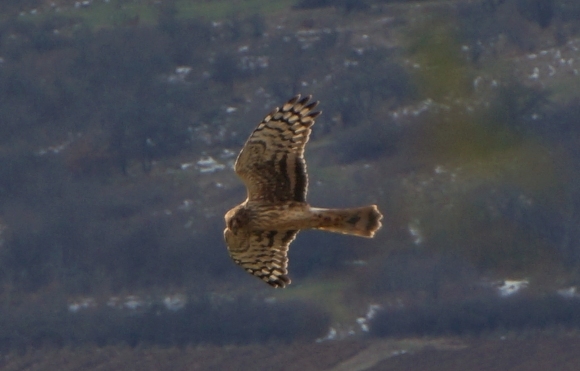 Separated from Marsh Harrier by plumage, lighter build and flight, from the two narrowwinged species by shorter and more ample ‘hand’ with 5th primary long, and broader ‘arm’. - Adult male: Wing-tips black, underparts white with blue-grey head and breast sharply set off, darkish trailing edge to underwing; upperparts blue-grey with white uppertail- coverts. - Adult female: Upperparts brown with white uppertail-coverts, inner wing with variable yellowish panel; underparts buffish-white, streaked brown. - Juvenile: Distinguished from adult female by more rufous-yellow underparts with fewer streaks, especially on belly, and more prominent and more rufous panel above on inner wing, not so yellowish and indistinct; pale tips to greater upperwing-coverts. VOICE: female has thin whistling ‘piih-eh’ when receiving food from male. Alarm of female a twittering ‘chit-it-it-it-et-it-et-it-et...’ with varying pitch towards end; male has a more display-like, straighter ‘chek-ek-ek-ek’. In breeding season during aerial display, male gives rapid, bouncing series of notes, ‘chuk-uk-uk-uk-uk’, somewhat recalling alarm of Little Gull.